i have a set of cruciani road wheels, 60mm x 46mm. would these be any good? pretty sure they're to hard for skates though. hmmm, i look a little silly there! my link didn't work! i had a link to some 90a bones, they were the ones i was asking if they were any good LOL. my CG's are great road wheels! i've had them from new, they're a little discoloured now but still holding their shape well, i'm going to try them out on my new outdoor set up before deciding whether to buy a new set of road wheels or not. I gotta set of Sims Street Snakes at the moment which i get on with really well when on various terrains, but m thinking of getting some of thse SFR SLICKS which apperently are really soft? has anyone tried em? Hey! I have a set of those Kryptos, but red! They're on my mother's old tennis shoe skates. LMAO!!!!!!! That's a riot! Because just this last weekend I put MY Kryptos on my sister's old tennis shoe skates and have been skating the driveway with them!!!! LOL Small world. Old Kryptos: 62 mm or 65 mm? Honestly I don't know... would have to look it up/search for it. I don't know off hand. It's not on the wheel itself. Genereally in the Uk most people skate using outdoor wheels. If someone over here does use an indoor wheel it is usually a belair hockey wheels. SO the average skater over here has good knowledge of outdoor wheels. I personally own about ten different types of Kryptronics (route 70,65 62, impulse etc), A few sets of SIMS both original and re-issues. Sure-grip aerobic, Airwaves, SFR slicks, Sreet hub. But without a doubt the best outdoor skate wheels I have owned or ever used are the RD Twister's. They are unbelievable! I even like using them indoors too. I have four sets of these wheels, which I obtained by having to by the skates that they come on :-) I could not find the wheels for sale on there own anywhere. The only thing I dont like is the fact that they take 698 micro bearings. Because I cant find upgrades for the bearings in this size I continue to use the ABEC 5's that come with them. Even with these bearings they are still faster then all the other wheels I have mentioned even with my bones swiss ceramic bearings in them. I made exactly the same experiences. I tested about 15 to 20 different sets of outdoor wheels in the past years, mainly the most of them are on the same level. There are just two wheels which are much faster than the rest, Roll line Helium 64mm 83a and more the RD Twister aka Velocity race with 65 or 70mm 84a. A girl I knew at our rink back in the early 80`s had a set of these in orange. She let me try them out. I didn`t use them outside, only at the rink inside. The rink had the blue blue roll on surface and man, these wheels wouldn`t stick for nothing lol. With them being round like that only a small section of wheel surface was actually touching the floor. I wasted no time giving them back lol. Nice Gullwing trucks. I own 4 of the Rollerballs, new and unused. 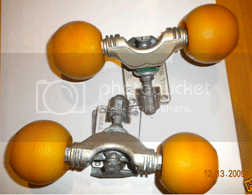 And I'm searching for 4 more, to complete a roller skates setup. I had a set of 8 pcs in red in 1981, don't ask me where they are today...? 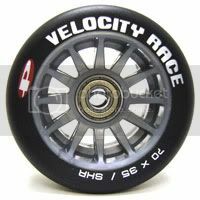 I too think the 70mm Twisters (Velocity race) are the best that I have owned or used. I have three sets of the twisters, but I have not used the velocity race although I have heard that they are the same. Have you or anyone else noticed any difference between the Twisters and velocity race? Also how does the boomerangs compare to them? Indeed! Does anyone here know of any place that has 698 micro bearings that are of a higher standard then the ABEC 5 bearings that come with these wheels? Its amazing how fast these wheels are with the standard bearings in them. Imagine if Bones made a 698 Bones swiss/Ceramic micro bearing! the speed would be insane!! 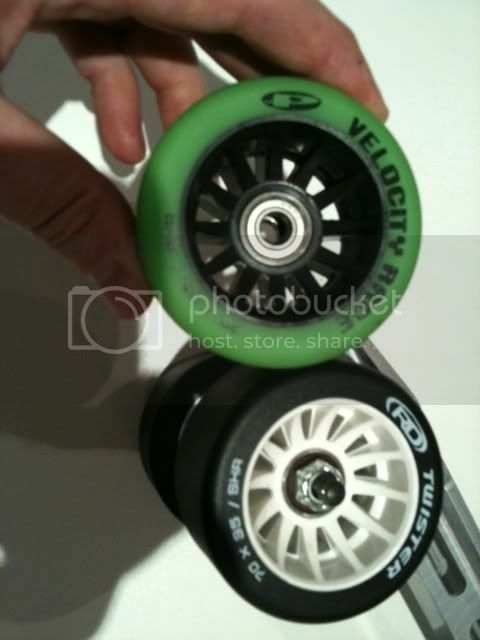 Also Are these wheels so fast because of the tire or because they take 698 micro bearings? Wasnt on Evil Bay was it with derby equipment?? ?